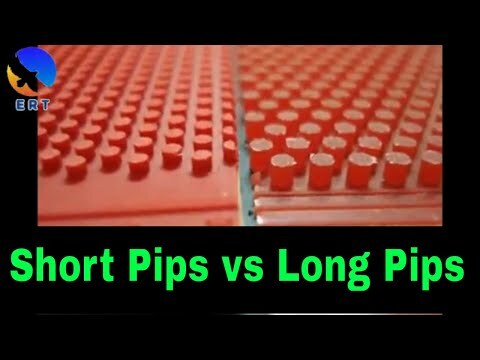 Many players are angry about long pips! We are angry because we are very bad at countering them. It is incredibly frustrating to play against a long pimple player. You want to blame your opponent! But don’t worry! Playing against long pips is not complicated as you think! Today, I will give 3 tips to deal with long pips. Simple but it works very well! Why long pimples really work? At the amateur level, most of the player hate playing long pips. Because they don’t know how to deal with it. They don’t have good tactics to counter. Some players call long pips rubber as “trash rubber” because they don’t know how to counter it! But at the higher level, long pips player can rarely win the normal inverted player. Because good player always has the best tactics to win the long pips. So how to win long pips player, and win them easily! First of all, we need to understand the mechanism of long pips rubber. Long pips “reverse” the spin on the ball. You give them a topspin ball, you will get backspin. For backspin, the ball comes back with topspin. For a no-spin ball, you get a no-spin ball. This is the strength and also the weakness of long pips. Why are long pips so effective? Because it’s not the same as normal inverted rubber. For normal inverted rubber, you topspin and you get topspin. You do the backspin, and you get backspin. And you are used to that. That’s why when you play with long pips, you are confused and make many errors! However, long pips rubbers expose to a huge default! The previous strength of long pips is also its main weakness. Because long pips can’t make spins on its own. It’s like a mirror! It reverses the spin! So long pips player can’t attack! They win the point because only you make errors! Once you understand and master the pace to play against long pips, you will control the game! They normally use pimple-out rubber on their backhand side. Blocker players stay close to the table and block the ball. They are very strong at changing the direction of the ball. Blockers love block on the bounce, of course :). But they are weak away from the table. They hate the ball at the wide angles but love standing near the middle of the table. And wait for the opportunity to smash, to hit with their forehand. They play further from the table. Defender wins the point with consistency and variation of spin. They have good footwork. And can chop at both sides, forehand side, or the backhand side with long pimples. Defender using long pimple rubber are very consistent. They are very strong at wide angles. The modern defender can also attack at two sides (like Ruwen FILUS). So here are my 3 tips to win easily long pips! I still remember a match: my player played with an average long pips player. He used wrong tactics! My player applied the same type of serve like in a normal versus an inverted rubber. He served short, and with lots of spins. And then the ball comes back short with topspin but the ball will not go forward! Because the long pips without sponge make the ball like that! And my player missed the ball badly! Each time, he tried to attack! He made the error! Now, do the “KISS”. Keep it simple spin! Now, serve long directly to the long pimple side (normally on the opponent backhand side). If you serve long with little spin, the ball will come back long and with little spin. If you serve long and with topspin, the ball comes back long with backspin. And then you should attack this long ball now! That’s is the purpose of “KISS”. Think the long pips is like a “mirror”. They can’t impact strong pin! It’s just a “mirror” of your spin. So you control the pace and the spin! And then, my player did it, and reduced so many unforced errors. The game becomes very simple now. One player attacked, topspin all the ball, and the long pips become the blocker or the defender. Always serve deep with controlled spin, and attack deep (deep and the long ball will prevent long pips to change direction). Long pips hate deep ball! Now they become a “mirror” of your spin! Mix up your serve! Fast, deep no spin serves or very slow no spin serves can make life very hard for a long pips player! Serve long! If they step back, and pivot to attack your serve with their forehand, you can surprise them with short serve to the wide forehand side! Look at this Chinese player! How easy she plays versus a long pimple. Always play deep ball to the pips side. She topspins the ball, and the long pips player blocks. The ball now has backspin. So she one topspin-one push, and one topspin, one push to control! Play wide angle, normally to the normal rubber side (on his Forehand for example). This tactic will make long pips player life even harder! Let’s study this game between Zhang Jike and Fabien Akerstorm. In this game, Zhang Jike used simple but effective tactics. Serve semi-long to the forehand side of Fabien. and Zhang Jike attacked first! So Zhang Jike controls the game first, and he only played long and deep ball! Because he also controls the placement, so he takes time! Don’t rush to attack! Play deep ball! Push it long if you can’t attack! And then attack the next ball! he is a blocker, not a defender! So basically, he is forced to change his playing style. Once Fabien is forced to defend far from the table. He can’t do much! Zhang Jike just controls and dominates the game! The long pips are now the “mirror” of your spin! Zhang Jike has won the set 11-1. With a good tactic, you can win long pips player, and win easily! Long pips is a joke! Serve to the forehand side, and attack first! Always keep the ball deep! And topspin all the ball! Push only necessary! Here is my last tip. Use often topspin, don’t push, just topspin loop all the day. Don’t push often with the long ball from pips. The ball will go up high! Amateur players just make this mistake! They don’t dare to attack first, and push too often! Remember: Topspin all the long ball! Many amateur players tried to push the long ball from the long pips. It’s the wrong tactics! Because you are making confused yourself! Why you should change the spin! You vary the spin (from topspin to backspin and vice-versa). It’s unnecessary to counter the long pimple player. Use only one type of spin versus long pips: Always topspin! If you change often the spin, you always change the “pace”, the rhythm of the game. Long pips love that! They love to disrupt your game! So here is the strategy to play against long pimples in table tennis. Thanks for the usefull lessons. What about medium pips. Is it the same like long pips? its not the same. medium pips can make some spin. you now can serve short underspin and flick it. Yes, I will make it. Stay tuned. Thank you for all your tips. My game has greatly improved from following your tips. However, im confused in this section as you presented 2 different tactics in playing against long pips. So is it topspin-push or topspin all day? Topspin-push strategy works for the lady on the video but ZJK topspins it all. Do you mean topspin-push if you are an amateur like most of us and topspin all day if you are a pro?! Yes this strategy works. especially the strength of the return shot. keep in mind push long wide angle to long pimple side and attack to opponent FH side. serve long underspin at short corner to opponent BH LP side instead of long angle to BH LP, it will be less easy to let them have wider control returning back to your own BH side. push long and attack. KISS.